Dentures are removable replacements for missing teeth and surrounding tissues. They are made of acrylic resin and, at times, combined with different metals. Dentures improve a person’s ability to talk and chew. They also support the muscles of the face and enhance a person’s smile and overall facial appearance. Complete dentures replace all the teeth, while partial dentures replace some missing teeth and prevent the remaining teeth from moving into a different position. Complete dentures, also known as full dentures, can be used on the upper jaw, lower jaw, or both. Complete dentures are referred to as “immediate” or “conventional” depending on when they are inserted into the patient’s mouth and when they are made. Immediate dentures are inserted right after the remaining teeth are removed. The dentist has to measure the patient’s jaw and create models for immediate dentures during a preliminary visit. Conventional dentures are inserted after the patient’s gums have healed, usually 6-8 weeks, following the removal of any remaining teeth. One advantage of immediate dentures is the patient will have teeth during the healing period. However, there is a possibility that the bones and gums will shrink over time, especially within the first six months after teeth are removed. In case the gums shrink, it may be necessary to rebase or reline immediate dentures for them to maintain a proper fit in the patient’s mouth. An overdenture is a removable denture that is placed over a few remaining natural teeth or implants. Before an overdenture is placed, the natural teeth have to be prepared to ensure that they are stable, healthy, and can support the denture. If the patient has several missing teeth, partial dentures are usually the solution. Removable partial dentures consist of replacement teeth attached to gum-colored plastic bases, which are connected by metal. Metal clasps attach partial dentures to the remaining natural teeth. Precision attachments, which are more aesthetically appealing than metal clasps and are barely noticeable, may also be used to attach partial dentures to natural teeth. Partials with precision attachments are somewhat more costly than those with metal clasps. 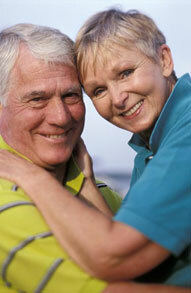 Getting dentures is a process that takes approximately a month and five dental appointments. The first appointment is an initial diagnosis. If dentures are the plan, the second appointment involves making an impression and wax bite to model the future dentures. At the third appointment, the patient tries the new dentures to test for proper fit, shape, and color. The final dentures are placed in the fourth appointment, with the final appointment being the time to make any final adjustments. When initial impressions are made, various measurements are also taken to show how the patient’s jaws relate to one another and to determine the amount of space between them (the bite relationship). The dentist also records the color of the patient’s natural teeth, if partial dentures are the plan. The impressions, measurements, and other necessary information are then sent to the dental laboratory for construction of the dentures. The laboratory makes the model or mold of the jaw. Teeth are placed in a wax base and the wax is carved to the exact form of the denture. A “try-in” of the denture is usually done at the dentist’s office so that any adjustments can be made before the final denture is constructed. The denture is completed using the “lost wax” technique. A mold of the denture is made then the wax is removed. The remaining space is then stuffed with pink plastic and the mold is heated in order to harden the plastic. The denture is polished and is then ready for the patient. With new dentures, the patient may feel awkward and find the dentures bulky during the first couple of weeks. However, this will pass and the patient will become accustomed to their feel. It will take some practice to insert and remove the dentures, but because they are custom made they should easily fit into place. Patients should not force partial dentures into place by biting down, as this can cause the clasps to break or bend. The dentist may ask the patient to wear the new dentures at all times. Although this may be a bit uncomfortable at first, it’s the fastest way to determine if adjustments need to be made. If the dentures put too much pressure on a certain area that area will become sore and the dentist will adjust the dentures for a more comfortable fit. Once the final fit is achieved, dentures have to be taken out of the mouth at night during sleep and re-inserted in the morning every day. When it comes to eating, the new denture wearer should start with small chunks of soft foods. Chewing on both sides of the mouth ensures that even pressure is applied to the dentures. Sticky or hard foods must be avoided, including gum. Stand over a sink or folded towel when handling your dentures, in case you accidentally drop them. The denture has to be brushed daily using a denture brush to remove food particles and plaque. Brushing also prevents permanent staining. Do not use a brush that has hard bristles — it can damage the denture. Find denture cleansers that carry the American Dental Association (ADA) Seal of Approval. If you have remaining teeth under metal clasps, they will need to be cleaned thoroughly as well. Plaque trapped under the clasps increases the risk of tooth decay. Dentures can be cleaned using mild dishwashing liquid or a hand soap. Most toothpastes and household cleaners are too abrasive and should not be used when cleaning dentures. Dentures should also be soaked in water or a soaking solution to keep them moist. Dentures can lose their shape when not kept moist. Metal attachments may be tarnished when immersed in a soaking solution, but can be cleaned. Before putting your dentures in every morning, the gums, tongue, and palate have to be brushed with a soft-bristled brush. Doing so removes plaque and promotes circulation in the mouth. A balanced diet is also important in order to maintain a healthy mouth. Dentures may need to be adjusted over time. The mouth naturally changes as a person ages, affecting the fit of your dentures. Bone and gum ridges may shrink or recede, leading to loose-fitting dentures. Loose dentures can cause infections and mouth sores and need to be adjusted by the dentist. It is important to see your dentist as soon as your dentures break, chip, crack, if an anchor tooth becomes loose, or if there are any fit issues. In most cases, your dentist can adjust or repair the dentures the same day. Complicated repairs may have to be sent to the dental lab where the dentures were originally made. Over time and due to normal wear, dentures may need to be re-based, relined, or re-made. A denture is re-lined or re-based by the dentist using the existing denture and refitting the denture base or creating a new base. If the dentures become loose and teeth show signs of significant wear, it may be time to get a full replacement. The patient with new dentures has to practice eating with his or her dental appliance in place. Start with small pieces of soft foods, and chew slowly using both sides of your mouth. Pay extra attention when eating hard or hot foods and foods with sharp edges. Other foods can be slowly added to the diet as you become accustomed to wearing dentures. Certain words will be difficult to pronounce with your new dentures. Reading out load and repeating words that are hard to pronounce will help. Speak slowly if dentures “click” while talking. Dentures may occasionally slip when laughing, coughing, or smiling. They can be repositioned by gently biting down and swallowing. If speaking issues persist, see a dentist right away, as your fit may not be as precise as it needs to be. Denture adhesives provide added retention for well-fitting dentures. However, they are not a solution for poor-fitting dentures. Dentures that fit poorly can cause constant irritation, leading to sores. These dentures may need a reline or a replacement. If dentures feel loose or cause significant discomfort, see your dentist immediately.